Patrick Wilson, 1861 (dated). Former church and hall, now Clinic. Gothic church with octagonal entrance tower. Squared and snecked stugged ashlar. 2-leaf timber boarded door with decorative cast-iron hinges in hoodmoulded pointed-arched surround flanked by columns with stiff leaf capitals in entrance tower with angle buttresses; hoodmoulded carved panel (see Notes) with carved labelstops; square-plan vestibule rising to octagonal tower with lancet at 1st stage, louvred lancets to each facet of upper stage and pierced parapet. Pitch-roofed nave of church behind, lit by tall windows with small leaded pane glazing. Gable end of hall to left altered at ground floor; 2 shoulder-arched windows (blocked) at 1st floor, bipartite in gable. E ELEVATION: rubble built E wall of E transept showing: 2 2-light windows with multifoils and small window in gable. Ecclesiastical building, no longer in use as such. The panel above the door reads 'Erected and endowed from funds bequeathed by William Whyte Edinburgh MDCCCLXI.' The Petitioners to the Dean of Guild were the Trustees of the late William Whyte, bookseller in Edinburgh. Set back from the road between 2 advanced properties, creating a shallow forecourt. Dean of Guild drawings show 2 shops in the flanking wings, and a bakehouse and oven to the rear. 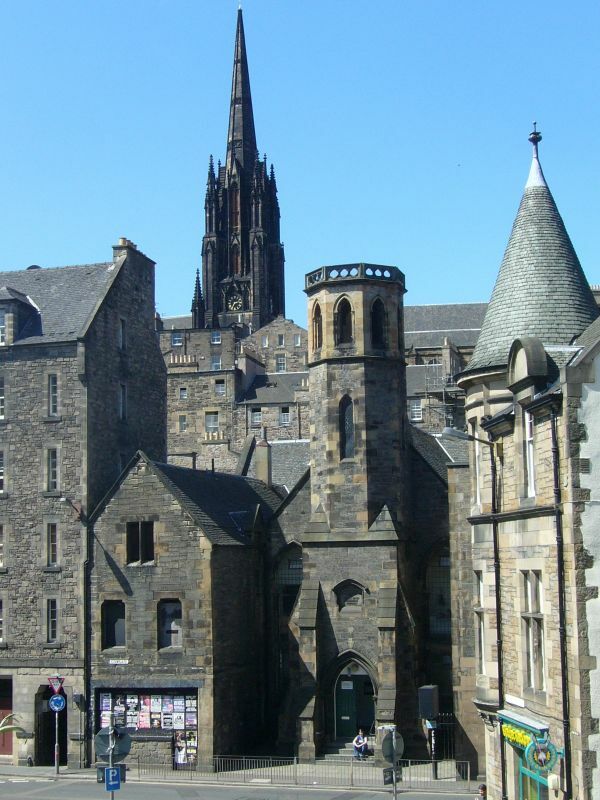 The tower may make reference to that at St John's Constitution Street, Leith, by David Rhind (1843), although the Dean of Guild drawings show that it was intended to have a small spire.